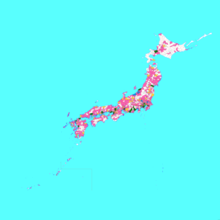 This is a list of cities in Japan, sorted by prefecture and within prefecture by founding date. The list is also sortable by population, area, density and foundation date. Most large cities in Japan are cities designated by government ordinance. Some regionally important cities are designated as core cities. Tokyo is not included on this list, as the City of Tokyo ceased to exist on July 1, 1943. Tokyo now exists as a special "metropolis" prefecture (都 to), with 23 "special" wards (with the same status of city) making up the former boundaries of the former city in the eastern half of the prefecture. The area figures are according to Geographical Survey Institute of Japan as of 2007-10-01. The source websites of each prefectures' populations are according to ja:Template:自治体人口/doc. ^ 月報　あいちの人口. Toyokawa's data is adopted the total of Otowa, Mito, and Toyokawa before the recent merger. ^ "各種人口統計". Archived from the original on 2008-01-18. Retrieved 2008-01-18.